All the work has been done, and you re set for three climaxes, one after another. Use the squared three-card packet to tap each of the single face-down cards, thought to be the selections, on the table Say »Finally each of them turned into one of the spectators. Turn the three cards face up and fan them to reveal the three selections, then table the fan to the right. Say "But of course the Brothers were the stars at this theater, and you can tell they were by the stars right in the middle of each one." At the same time turn over the three single face-down cards to reveal the Aces. Indicate the center pip when you reach the end of the sentence. Continue, saying. 'You might wonder what happened to the Marx Brothers? They were out in the theater watching the whole show." At the same time turn the card on top of each third of the deck face up. leaving it in position. Afterward all four lacks will be in a row. Haven't there been numerous times when you wanted a certain young lady (or voung man) to have your Phone number, but it seemed awkward to just hand it over? Wouldn't it be just dandy if a magician helped you get your phone number into her/his hand? From the point of view of the appropriate audience, you could perform no better service! Cards have been Pushed over, and the block formed, your right hand m it. Flip the deck face down and drop the face-up right-hand cards, as they are back on too Fron, ,h ,op of the deck down, the order is. four face-up Deuces, four face-up Queens, rest of Ice doVn dec "
Execute The Swivel Switch described and shown in illustrations I through 4 of "The Marx Brothers " Yon wiU be displaying the four Deuces (and naming them), lifting each card one at a time with your right hand and flashing the back. (The second Deuce is taken beneath the first one. etc.) For this particular effect tie first two Deuces should not be squared in your right hand. This gives the spectator a good look at all four Deuces when your left thumb shoves over the third one (fig.I). At that moment say. "And this is the one you're thinking of." This third Deuce is then taken beneath the first two. and its back is flashed. Finally your left thumb shoves over the fourth Deuce and all four face-up cards beneath it as one. Your right hand takes this block onto the rear of its packet, then lifts the whole thing and flashes the back. 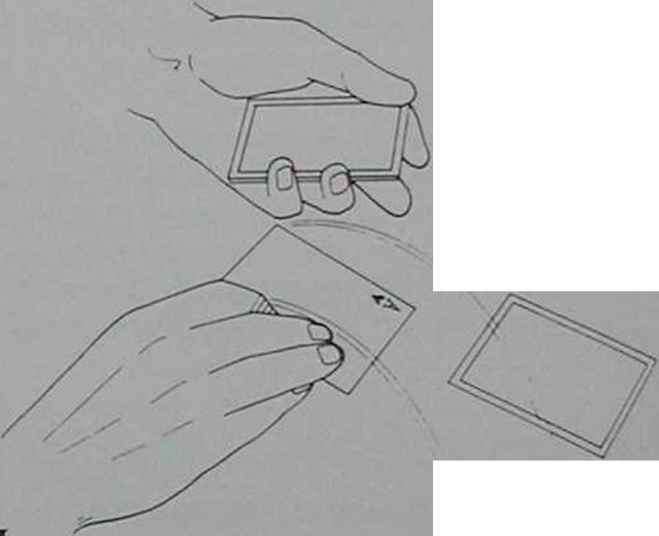 The switch concludes by turning the right hand palm up and flipping the packet over onto the deck. Done smoothly, the block cannot be seen. Immediately thumb off the top four cards into your right hand without reversing their order. Spread them on the table in a horizontal row so the uppermost card goes to the right. Say. "I want you to watch these and make sure that I don't come back and steal them. You also better watch this gentleman - he looks like a ladies' man". As you talk, execute a Slip Cut to lose the top card near the top of the deck. Your right hand simply lifts about ten to fifteen cards in Biddle Grip and pulls them to the right while your left thumb retains the top card in position, pulling it onto the lower half of the deck. Drop the right-hand cards back on top. The Two of Clubs is now on top of the deck. lhb&y- t0 the gentleman. "Sir. would you please cur the deck anywhere you like, turn those cards over onto <•' ones still in my hand, and we'll use your choice." This is the same Force already used in "The Magic arcls." The spectator follows your instructions, and you immediately turn your left hand over (rolling the m K)" The hand descends to the table and does a wide ribbon spread from left to right. Locate the uppermost face-down card in the center of the deck and push it out of the spread, in front of the gentleman. Ask hun to write his phone number on the back of the card in large letters (it's best to have a marker ready for hlm>; While he's busy, turn the upper half of the deck face down, reassemble it. and place it aside. Watch as he writes and repeat the number to yourself several times. 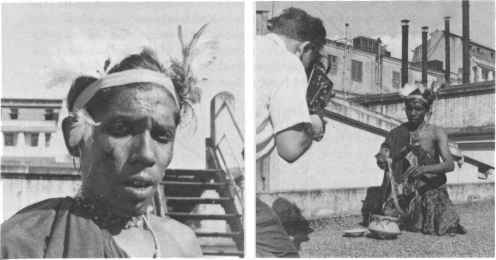 », card with the phone number, is seen by the audience for the nr..
Shove the face-up Two of Clubs forward a few inches, then place the face-up Queen, held by your right hand back into the vacant spot in the horizontal row of face-down cards. Say. A real ladies' man iSn; s^fi^iZusZe^irl. and so this gentleman would probably like to have all the ladies." Turn over the three face-down cards one at a time to reveal the other three Queens. The handling now departs the realm of logic with a slight lurch: Lift the face-up Queen originally chosen by the gentleman with your right hand, slip it beneath the Two of Clubs, and repeat the Wild-Card Move Both cards are scooped up. the hand turns over, and the uppermost card slides back onto the table beside the three face-up Queens. Instantly focus all attention on the card in your right hand by asking the lady if she remembers the gentleman's phone number. Repeat the number aloud and hand her the face-down card with the request that she hold onto "thegentleman's Queen." Scoop up all four cards on the table and mix them together. Ask the gentleman. "Do you mind if she keeps your phone number? Then let's magically put it on her card — the Deuce. Here's your Queen, with no phone number." After a bit of shuffling, turn all the cards face up to reveal that the Queen originally chosen has returned to the packet. Next, turn the cards face down one at a time to reveal that the gentleman's phone number has vanished from the back of the Queen. Finally, ask the lady to turn the card she is holding face up to reveal that his phone number is on the back of her Two of Clubs — the card she named and was watching all the time! One last presentational note. If you find that the gentleman is hesitant to write his phone number on the card, don t press the issue. Immediately add. "It can really be any number, or a picture, or even just your signatureYou don't want to create an uncomfortable situation (after all. he might be having a rotten evening and not want this girl to have his phone number!). Both cards aire taken by your right hand, which moves forward to the table. Without pausing, leave the face-down Four of Hearts on the table and place the face-up Ace of Spades just inward of it. You will again form two horizontal rows of cards. The spectators believe that the face-down card is the red Ace. Thumb over the next two cards and take the pair with your right hand. Let the upper face-down card of the pair slide onto the table just to the right of the first face-down card. Immediately turn your right hand over to display the Two of Spades, placing it to the right of the Ace (fig.2). Repeat the actions described in the preceding paragraph to lay down the remainmgcards^Thethjrd pair ostensibly both Threes, is thumbed off and the upper card is placed face down in the ^Z ' ZZX, o> the Deuce, while the lower card is left face up in the inner row to.ther^o he Deuc crfSpjde. The remaining pair is handled the same way so that there are now tour face-down cards in Ace through Four of Spades (from left to right) face up in the inner row. Jf Spades to reveal the Two of Hearts. Openly switch the posttons» 01 me f Ihe Three of Spades to reveal her"' F°Ur °f Spades" Snap >'°ur fin9erS and tUrn °Ttn TeZ Z Four of Hearts. Do a Triple Lift from the I^^^^Ub ing yo r right thumb and fingers to grasp the right long sides of up Into the carS remaining in your left hand. The Ace of Spades will show. Drag a single card out from the bottom of the packet simulating the multiple lift technique you've been using, and flip the card over to display the Three of Spades. Turn it face down and table it inward of the Three of Hearts. Your right hand lifts the remaining face-down card out of your left hand and places it inward of the Four of Hearts as you announce confidently. "Four." Openly exchange the positions of the Ace and Two of Hearts. Next, openly exchange the positions of the Two and Four of Hearts. Turn over the inner row of Spades one at a time to reveal that the values match. Spread them between your hands and take the upper two (Three and Four) in your right hand. Display the cards then slip the left-hand cards between the Three and Four as already shown in figure 3. Immediately square the packet and turn it face down. Execute a handling much like that already done in Part Two. Do a Triple Lift from the bottom of the packet so the Four of Spades is seen on top of the left-hand cards. Flip the triple card face down and deal off the top card Your right hand tables it inward of the Four of Hearts. Do a Double Lift from the bottom of the packet to display the Three of Spades. Flip the double card face down Thumb off the top card, take it with your right hand, and table it inward of the Three of Hearts. Slip a single card out from beneath the packet flipping it face up onto the card remaining in your left hand, to display the Two of Spades. Turn the card face down and table it inward of the Two of Hearts. Take the remaining face-down card from your left hand and confidently table it inward of the Ace of Hearts as you say. "Ace." Turn over the face-down cards one at a time from left to right (Ace. Three. Four. Deuce). [award of the Four of Hearts. Then, do a Double Lift from the bottom oi ^lXZ*Z™* n nbW is Hipped face down and the top card is tabled inward of the Ace of Hearts Ne slin T V ? ^ ~ 1 .he bottom of the packet to display a Three - this is flipped face downed t of Hearts. The last face-down card is taken from your left hand, miscalled the the Two of Hearts. Snap your fingers and turn over the face-down cards one at a time from left to right to reveal that thev are in the same order as the red cards (Four. Ace. Three. Two). Part Five. Say. "Let's openly mix all eight card." Place the Two of Spades onto the Ace of Hearts. Place the Four of Spades onto the Three of Hearts. Place the Three of Spades onto the Two of Hearts, and the Ace of Spades onto the Four of Hearts. This creates four pairs of cards on the table. The pair with the Three of Spades on the face is placed onto the Two of Spades pair. The pair with the Ace of Spades on the face is placed onto the Four of Spades pair. The entire packet with the Ace of Spades on the face is placed onto the Three of Spades packet. This should appear to be a random sequence to the audience. Finally, lift the Ace of Spades off the face of the cards and use it to scoop up the packet. Turn the cards face down. down three more pairs of cards, each to the right of the one before. Aftmv^ ^vui down cards and a row of face-up cards (Hearts, in Ace to Four order rrom le t ^ nght). P .
Place this in your pocket and you're ready to go. Heres a veru strange puna huhu / ww — ■- . t * j above the lowermost two cards. Spread the packet between your hands, taking the first three cards singly. 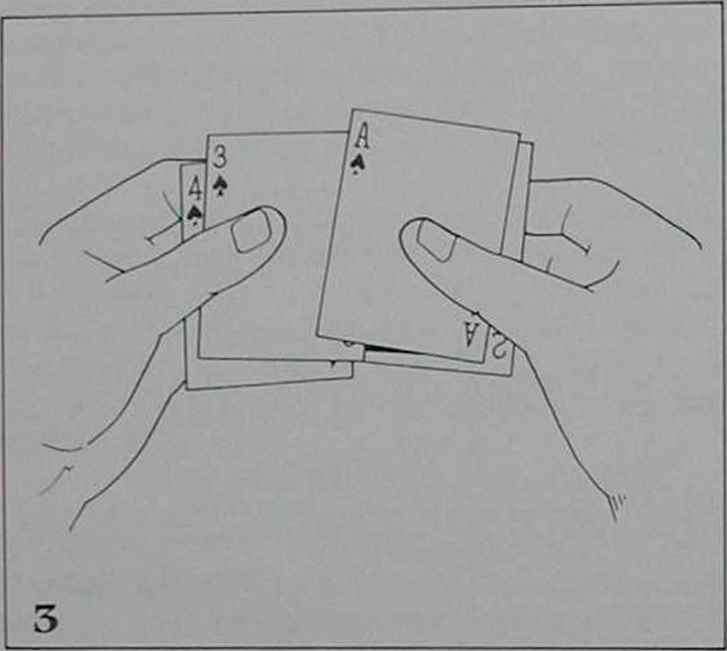 Insert your right fingertips into the break, so the fourth card taken is a double. The remaining two cards are held as one in your left hand. Square the packet and turn it face up. holding it once again in dealing position. Small-Packet Double Deal Turnover. Spread over the face card. King of Diamonds, about a quarter of an inch with your left thumb. The inner left corner of the card remains pressed against your left thumb base so the card is angled slightly. Your right thumb and fingers grasp the right long side of the pushed-over card at center (fig.l). 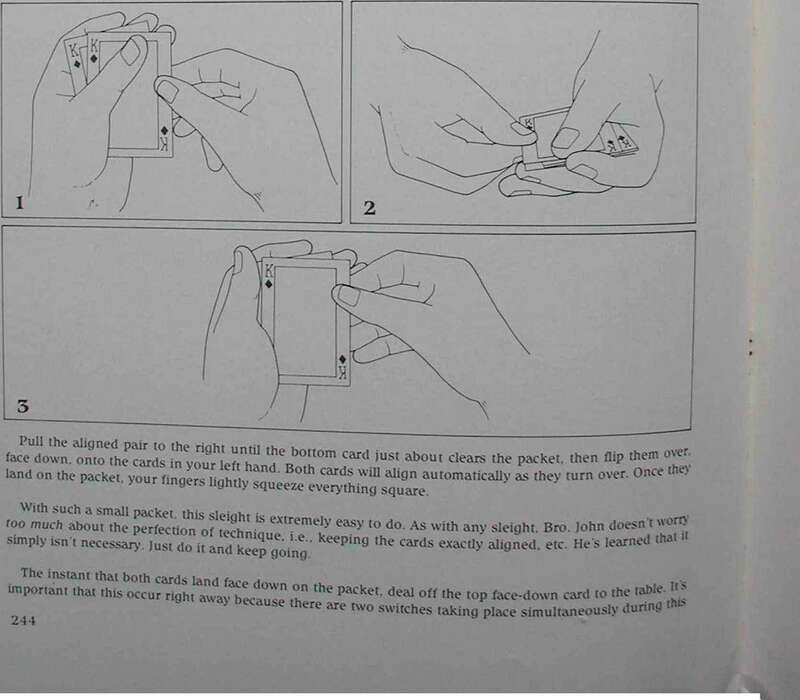 Your left second fingertip moves up against the outer right corner of the lowermost card and shoves it to the right until it is roughly (no need to be perfect) in line with the top card (fig.2). Move your left thumb to the outer left corner of the packet (fig.3). hut the card which lies second, on the face of the pack^T ^ deah off ™e second k. Zdown, is also switched. The audience sees a King of Diam, eneath the do«ble °bvi"
Do not deal off the top card. Instead, repeat the Small-Packet Double Deal Turnover again (this is the fifth time), turning the face-down card on the face of the packet face up to reveal the King of Spades Immediately spread the King to the right to reveal the Ace of Spades beneath it. The lowermost three cards are held as one. Your left thumb holds the King spread slightly off the Ace. freeing your right hand. Turn over the three cards on the table to reveal the balance of the royal flush. Put the three cards, face up. onto the King and hold the packet spread between your hands for a moment. Square the cards and pocket them to end. One final thing. The Small-Packet Double Deal Turnover, which is used in another trick or two in this book, is not a new idea. Others have done this type of thing before using various techniques. It is application to this trick that will leave them in disbelief.